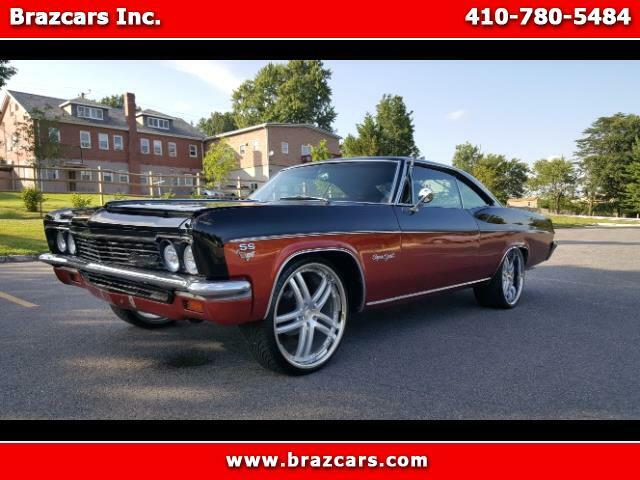 Used 1966 Chevrolet Impala SS for Sale in Rosedale MD 21237 Brazcars Inc. This is a true SS. This car went through a true frame off restoration, taking 2 years and a thousand of dollars. Money was no object. The interior was just done on Leather/Diamond patter at $8.000 (I will provide hundred of pictures during this amazing restoration process). The invoices for this Restmod is around $40.000 for parts alone. This car will need some tuning, due to be in a car collection/display for the past few years. The engine and transmission for this car is the famous RAM Jet 350, and to make it even better, the engine was installed few miles ago. This car also have Edelbrock Gas Stocks and Disk Brakes on all corners. The A/C may need some gas on it. The installed Dash on the car is the first one from Dakota Digital. This car also have remote Pop Up doors and Power Windows. Corvette Z06 Seats that were not much used since installed, because the car has been on Showroom display for the past few years. Incredible body work done, prior to paint, all new metal, fenders, quarter panel, floors etc.. It's a lot of car, a amazing classic reasonable priced and a good investment for sure. Feel free to contact me at anytime. Visit Brazcars Inc. online at www.brazcars.com to see more pictures of this vehicle or call us at 410-780-5484 today to schedule your test drive.